Endo is another decent group in the burgeoning wave of modern rock bands that know how to write songs while drawing from a multitude of rock influences and incorporating some of music's more recent popular styles. "Songs For The Restless," Endo's second major label album, is chock-full of hard-hitting tunes that reveal that catharsis isn't lost on the new generation of hard rock bands. 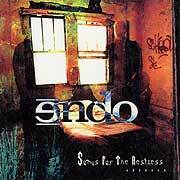 Almost anything you'll find on the web regarding Endo will describe the band in terms better suited for rap metal. Rap metal is a dying genre and I doubt Endo were ever truly a rap metal band, but certainly have been more appropriately described as a nu-metal band - and even that doesn't do the band justice. Although what I'm hearing is more in the vein of modern rock with a significant degree of emotion in the music and lyrics a little bit of rap metal/nu-metal influences can be heard in the songs' high-water moments. With Endo's "Songs For The Restless" I am hearing what Life Of Agony would have sounded like if LOA had started in the late '90s instead of the early '90s. Take that description for what it's worth, but that's the indelible impression that I've been left with. Endo's ability to span the musical spectrum from hard rock to radio-friendly alt-rock positions them well to make some noise on the touring circuit where they can win over unsuspecting concert goers. The track "Simple Lies" should be a radio staple by the time Summer 2003 comes to a close. Fans of Trapt, Foo Fighters, Cave In, and Korn's "Untouchables" will enjoy Endo's "Songs For The Restless." "Songs For The Restless" was produced by Paul Trust and Endo. Endo is Gil Bitton on vocals, Eli Parker on guitar, Zelick on bass, and Joe Eshkenazi on drums. For more information visit http://www.endomusic.com.